The blame game that has followed last weeku2019s shooting down of a passenger jet has focused attention on photographs in helping to trace the journey of a suspected ground-based missile launcher. 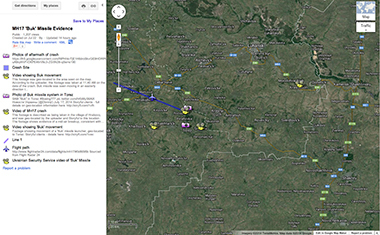 Online detectives have used social media to help pinpoint and corroborate the alleged location of the launcher that is said to have been responsible for the downing of Malaysian Airlines flight MH17 on 17 July. The social media revolution, and the rise of the citizen journalist, has given amateur and professional investigators a wealth of images and potential leads in recent years. British blogger Eliot Higgins, founder of the respected Brown Moses Blog, explains how a still image of the alleged attack vehicle, combined with video captured in the vicinity two years ago, suggests the image of the Buk-M1 launcher was taken in Torez, Ukraine. 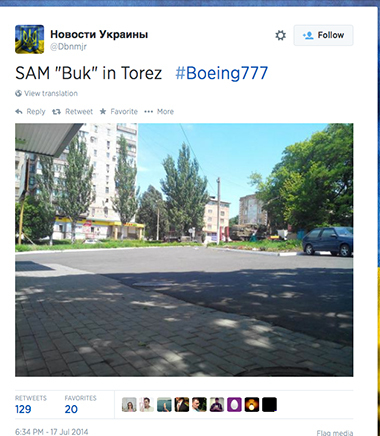 Help from US-based Twitter user Aric Toler helped Higgins verify the location, bolstering claims that the missile launcher was heading to Russia after the attack. Faced with a deluge of images shared on social media, a big challenge for analysts is ascertaining whether images posted on sites such as Twitter and Instagram are what they purport to be. The location, date and time that a photo was captured are among key factors that must be verified, along with the reliability of the source, to ensure the image is neither a hoax, nor presented out of context, even if, in technical terms, it may be a genuine photo. And mistakes can happen, as Claire Wardle, an expert on user-generated content points out. 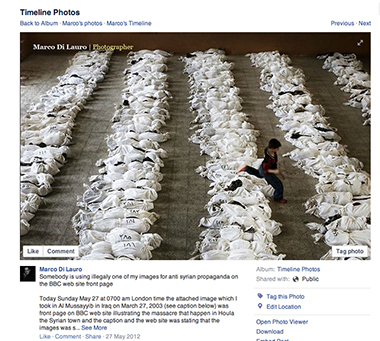 In a recent ‘Guardian Masterclass’ on social media for journalists, held at the newspaper’s offices in central London, Wardle explained how, in May 2012, the BBC mistakenly published a photo that purported to show the aftermath of the massacre of 100 people in Houla, Syria. The photo (below) showed shrouded bodies, in neat rows, with a child jumping over one of the rows. It turned out that the image had been taken almost ten years earlier, not in Syria, but in Iraq – and was captured by a professional photographer. In an apology, the BBC said it had first spotted the image on Twitter, adding that it had apparently been sourced from Syrian activists. News events ‘invite false information to circulate, either deliberately or by accident’, Wardle explains in the Verification Handbook. Wardle adds: ‘Therefore, journalists and humanitarian professionals should always start from a position that the content is incorrect. Storyful is a 24-hour news agency for the social media age, which was set up to help the media and other organisations verify user-generated content from the millions of photos and videos posted each day. In its analysis of the Malaysian Airlines disaster, Storyful has created a map of images and video shared over social media that it has managed to geo-locate (see below). Some verification tools are available to the public and free to use. A simple search on Google Images can determine whether an image has been published previously, for example. Another free tool is TinEye, which allows users to upload an image and conduct a ‘reverse image search’. Google Street View and satellite data on Google Earth can help corroborate the location suggested in the image, using identifiable landmarks, such as church spires and trees. While a quick check of local weather information, using the website WolframAlpha, can help establish whether the conditions tie in with those at the date and time suggested by the person who posted the online photograph or video.